Happy Buddha, Buddha, Buddha statues, Happy Buddha statues. Often called the Happy Buddha or Laughing Buddha, he is really Hotei or Pu-Tai (literally cloth sack) and known in China as the Loving or Friendly One. He was an eccentric Chinese Ch'an (Zen) monk of the T'ang Dynasty. He was known for carrying a sack of candy, which he handed out to children in the street. ). His large protruding stomach and jolly smile have given him the common designation "Laughing or Happy Buddha." According to legend, if one rubs the Happy Buddha's great belly, it brings forth wealth, good luck, and prosperity. Hotei is also referred to as the patron saint of the weak, poor and children. 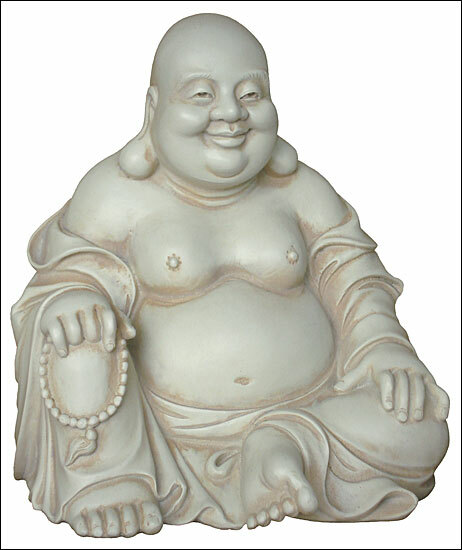 Happy Buddha statues depict a stout, smiling or laughing bald man in robes with a largely exposed pot belly stomach, which symbolizes happiness, good luck, and plentitude. Some sculptures have small children at his feet. Another item that is usually seen with the Happy Buddha figure is a begging bowl to represent his Buddhist nature. His image graces many temples, restaurants, and amulets, as he has become a deity of contentment and abundance. The image of Hotei is almost always seen carrying a cloth or linen sack (One which never empties), which is filled with many precious items. Many Chinese see him as an incarnation of the Buddha Maitreya (the Future Buddha), but this claim was only allegorical and with no basis.